Riddle me this, riddle me that - who's the Bat-foe with the most stylish hat? 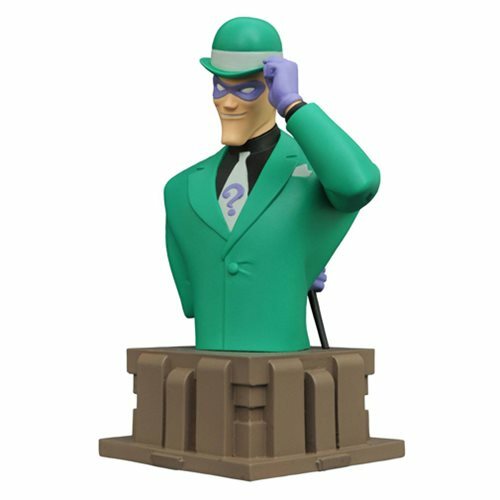 Based on Batman: The Animated Series, the Riddler, joins Diamond Select's epic line of resin busts! Captured in his suit from the early seasons of the show, this detailed bust measures approximately 6-inches tall and is featured atop a pedestal base inspired by Gotham's art-deco architecture. Packaged in a numbered, full-color box with a numbered certificate of authenticity, this Batman: The Animated Series Riddler Bust is limited to just 3,000 pieces. Sculpted by Varner Studios. Ages 14 and up.